Thanks to new waves of technological disruptions and breakthroughs coupled with the impact of the Fourth Industrial Revolution (all of which we will collectively refer to as Industry 4.0), we are now edging closer to living in the “futuristic world” that for decades we could only imagine in sci-fi movies. Intelligent talking robots, smart wearable devices, autonomous vehicles are just the tip of the iceberg of the potential that we can discover in the era of Industry 4.0. Technologies such as robotics, artificial intelligence (AI), machine learning, virtual reality (VR), augmented reality (AR), cloud computing are maturing and are going to radically transform the way businesses operate. Smart systems that are fueled by data and machine learning allow decisions to be made without the involvement of human beings, and it is only inevitable that mundane, routine jobs will be replaced as a result of automation and robotics. Dell Technologies’ “Emerging Technologies’ Impact on Society & Work in 2030” report published in 2017 revealed that almost 40% of jobs ranging from entry levels to the C-levels will soon be replaced by 2030. This has far-reaching implications for students aspiring to join the workforce of tomorrow, and Institutions of Higher Learning have to play an increasingly pivotal role in Future-proofing students. This is where we come in. 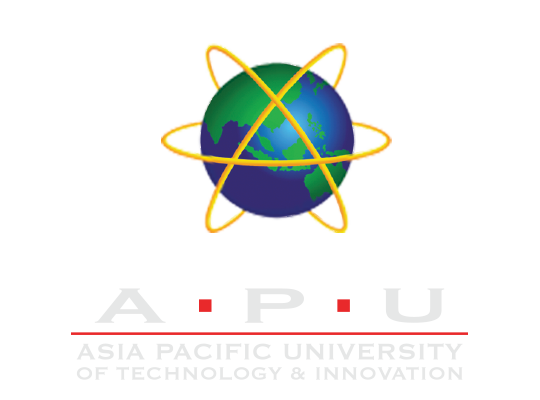 At APU, regardless of discipline, we ensure that all students are empowered with the ability to keep up with the challenges within the world of Industry 4.0 and beyond, by upholding our Vision as a University of Technology and Innovation to nurture the world’s future innovators. In line with Industry 4.0, with revolutionary technologies in place, new jobs titles emerge, and new talents are needed. While Industry 4.0 transforms our lives, it also transforms the way a university should deliver knowledge, as well as the forms of knowledge that should be equipped by the future workforce. Traditional degrees are becoming obsolete, where innovation provides the turning point and the catalyst for success. 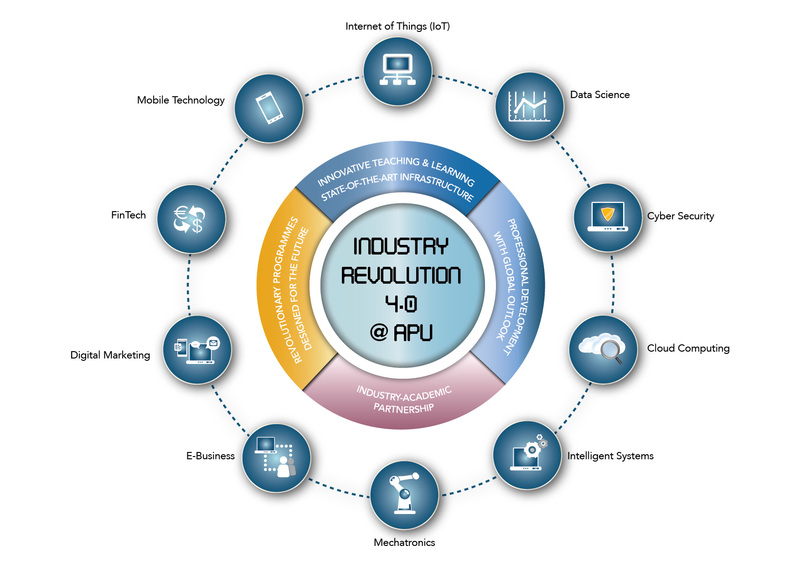 Through the constant innovation and delivery of a wide range of programmes with Technology as a common core, APU constantly seeks to unleash the potential of Industry 4.0 education. This is done by developing Industry 4.0-relevant programmes that are first-of-its-kind, such as in Cyber Security, Data Science, IoT, Intelligent Systems and Cloud Computing. These programmes were carefully designed together with our industry advisory panels, to equip students with the latest technical and soft skills that are required by the future job market. While Industry 4.0 also impacts the global business, accounting and finance spectrum, our students who are currently undergoing their studies in Business Management, Accounting, Banking & Finance are also exposed towards Industry 4.0-relevant areas such as Financial Technology (FinTech), Digital Marketing, E-Business and Blockchain. We have re-designed the programmes to incorporate both traditional financial and business methods as well as innovative emerging technologies, ensuring that our Business, Accounting and Finance graduates are future-proof and Industry 4.0-ready as well. 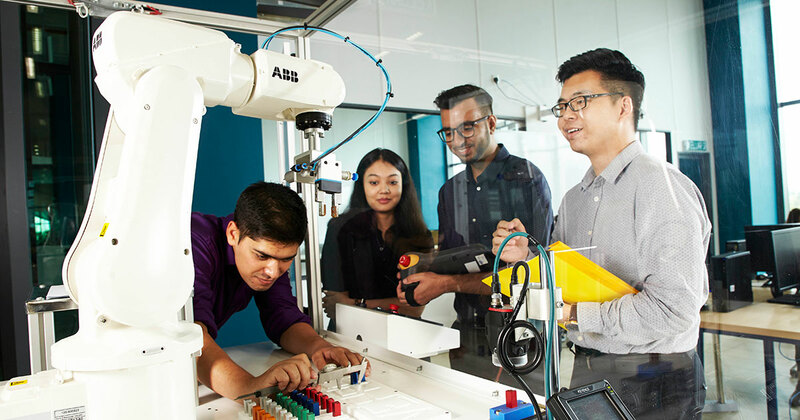 While a university campus serves as the arena for talent development, world-class facilities within the APU campus support the Industry 4.0-focused teaching and learning process by providing students with an ecosystem for their development. Creativity and Innovation are nurtured through the availability of discussion spaces, think tanks and Innovation Labs within APU’s iconic campus, which is strategically located in Technology Park Malaysia (TPM), Bukit Jalil. Industrial-grade infrastructure allows students to be exposed to real-time data and scenarios, training them to become competent technology professionals even before they graduate. 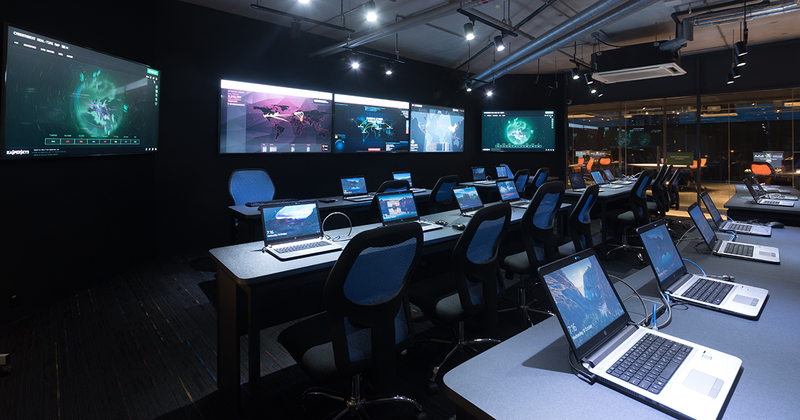 For instance, the first-of-its-kind APU CyberSecurity Talent Zone features military-grade real-time cybersecurity monitoring software at the full-fledged Cyber Threats Simulation and Response Centre and Security Operations Centre, providing them real-life exposure and practical experience. Learning is no longer confined within the classroom; in the era of Industry 4.0, one’s practical knowledge becomes as significant as academic and theoretical knowledge. Industry 4.0 adoption and development requires a high level of critical thinking skills. Apart from providing world-class facilities, a university is responsible for developing innovative teaching and learning methods, to produce graduates that can think critically, act innovatively and communicate ideas effectively. . Striding on our ICT strength, we have embraced technology clubbed with state of the art engineering practices to feed knowledge and practical skills to our students. All APU students go through strategically designed curriculums powered by innovation, and embrace advanced digital technologies and automation. As part of outcomes-based learning at APU, they are able to deal with complex, dialectical and exciting opportunities in current and future employment trends. Industry 4.0 is all about the “industry”. While a university serves as a platform for developing talent, it is vital to ensure that the talents nurtured are in accordance with the expectations of the industry. At APU, our industrial partnerships with innovative accelerators such as GrowthX Academy and Supercharger further enhances the platform for students to realize their world-changing ideas. The formula has proven to be a success, as APU students have been well-recognized through their victories in national and international level competitions organized by major industry players, such as FAMELab, Intel-CREST Industry-University Challenge, NASA Space Apps Challenge, World Asian Business Case Competition, SAS FinTech Challenge and many more. Under this formula, over 40,000 alumni are employed globally in reputable multinational companies such as Accenture, HP, IBM, Huawei Technologies, Astro, Maybank, Standard Chartered and more. Being an Industry 4.0-ready Graduate also means that a student has to be capable of communicating effectively, in this era of globalization and multiculturalism. APU students operate within a globalized campus environment that houses a community of students from more than 120 countries. A global outlook, international understanding and respect can be nurtured through the continuous immersion in multicultural discourse, as events such as Independence Days, Multicultural Nights and other cultural celebrations take place regularly in the vicinity. In the era of Industry 4.0, where communication and business processes are conducted in a global scale, having a global outlook ensures that graduates are well-trained to engage in global conversations, international strategies and multicultural encounters. At APU, the continuous cultivation of global outlook within the campus builds our students’ confidence and equips them with relevant cross-cultural communication skills, making them workplace-ready even before they graduate. In line with our practical teaching methods, APU instills practical workplace skills within the curriculum, to build students’ confidence and eventually become workplace-ready. As a unique feature, our students proudly dress in professional attire, while adhering to a professional code of conduct on-campus. Together with over 10,000 industrial partners and potential employers, we create an environment that simulates the future workplace, so that our students joins the future workforce confidently. The transformation from a high school leaver to an industry-ready graduate is a crucial process in one’s life, where a university plays an important role to future-proof school leavers and transform them into industry-ready graduates. While combining our philosophy of providing professional education with the cultivation of Industry 4.0-relevant skills and global outlook, our students are fully-prepared to join the future global workforce with confidence, not just for their first jobs, but for lifelong careers. 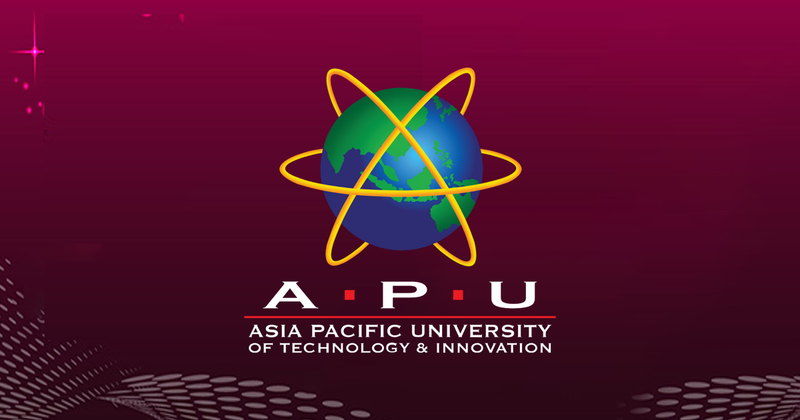 APU was announced as among the Highest Rated Emerging Universities in Malaysia, being rated at TIER 5 (EXCELLENT) under the SETARA 2011 Ratings by the Ministry of Higher Education (MOHE) and Malaysian Qualifications Agency (MQA), and has maintained this Excellent rating in the SETARA 2013 Ratings and the latest SETARA 2017 Rating. Under the Quacquarelli Symonds (QS) 2017 Ratings, APU was awarded 5-Stars in 4 categories of the QS Stars Ratings – Teaching, Employability, Facilities and Inclusiveness. The QS Stars rating is an international rating system that measures achievements and qualities of universities worldwide. In addition, in 2017, APU was also announced as one of Malaysia’s Premier Digital Institutions of Higher Learning (IHL) by the Malaysia Digital Economy Corporation (MDEC), for its commitment in offering top-notch digital technology courses and ensuring highly-skilled graduates continue to flourish and fill future digital job demands locally and globally.